Fall is the ideal time to plant spring blooming bulbs. They can be planted as late as November-December before the ground freezes. Temperatures 35-50F degrees for 8-12 weeks will give them time to develop a good root system. -When buying bulbs, check for quality. Be sure they are firm without soft spots or white mold. -Bulbs need a light, well-drained soil or they will rot. For heavy, clay soil, incorporate organic materials such as peat moss or compost to improve drainage. -They do not require fertilizer but will perform better when fed. Work up the soil and add bulb booster or a 5-10-10 fertilizer for vigorous future growth. The bulb should have no contact with the fertilizer, as it will burn developing roots. You can put bone meal in the bottom of the hole. Once planted, sprinkle bulb fertilizer on top of the backfilled soil in the fall or spring. If you don’t fertilize at this time, the best time is right after bloom (12-12-12 or 5-10-5). Mulch planted bulbs after the ground freezes to protect from freezing/thawing cycle and remove in the spring. A general rule for tulips and daffodils is 3 times the diameter of the bulb. Cover small bulbs such as scillas, grape hyacinths, snowdrops with 2 inches of soil and large bulbs 6-8 inches. Other bulbs may vary a bit. Check package directions. In warmer climates bulbs can be planted 2 inches shallower. -Plant pointed tip up, if not sure plant the bulb on its side, it will find its way up. If you have problems rabbits, squirrels or chipmunks digging up your bulbs, here’s what you can do. When planting cover the bulbs with half the soil, then cover place chicken wire and fill in with the remaining soil (at least 1 inch). The chicken wire will keep the critters from digging up the bulbs. Plant less desirable bulbs such as allium, camassia, chionodoxa forbesii ‘Pink Giant’, colchicum ‘Waterlily’, eranthis (winter aconite), fritilaria, galanthus nivalis(snowdrops) muscari (grape hyacinths) and scilla siberica, which aren’t as tasty. Animals won’t bother daffodils or hyacinths, as they don’t taste good and are poisonous. Hi, is there any way for growing tulip bulbs in the tropics ? Tulips require a dormant cooling period in order to rebloom each year.They need temperatures around 45 degrees for 8-12 weeks to develop a good root system. In addition, tulips need a dry summer or the bulbs will rot. I live in Chicago and found a bunch of tulips that have passed their blooming period and were clearanced. I bought a ton of them. Is it too early to plant them in Chicago? What do I do with the yellowing leaves? Should I remove them or plant them with the bulb? You can plant your tulips in outdoors and let the leaves continue to yellow and die back. Do not remove the leaves-they will replenish the bulb so that it can grow and bloom next year. Tulips that have been forced in pots will not blooms as readily next year but should bloom the following year. Hi, I planted about 30 canna lilly bulbs last week and now its snowing. I live in michgan zone 6. Do my bulbs have a chance? What should I do? It would have been better if you waited for the soil to warm up before planting or planted them in pots indoors. They should be planted after the threat of frost is over in your area. I think they will be alright since they haven’t sprouted yet, the soil/snow will insulate them and . Your canna will not grow until the soil & temperatures warm up. At this point, I would leave them. I just bought a ton of bulbs….I live in Minnesota, zone 4. We could even have a couple of inches of snow this weekend. I have peony, iris and glads. Can I plant them now? They are starting to sprout in the bags but appear to be very fresh and healthy. Secondly, will they bloom this year? Gladiolus are summer-flowering corms that are tender plants that die with freezing temperatures and should be planted after the last spring frost. You can plant your peonies and iris now (although fall is a better time). The glads should bloom this year, as for the iris- bloom may not happen this year. In addition, it takes 3 years for a peony to establish its roots system and bloom. I live in zone 7 and I was given a big bag of daffodil bulbs on April 1. The green stems remain on the bulbs and the flowers have dried up. I’d like to plant them immediately in my yard rather than store them until next year. Is that a good plan? Yes, plant them asap so that the leaves can continue to grow. hi i had some left over bulbs from last year and decided to plant them indoors since they were still firm and not rotted, also they had no mold on them. After i had planted them about a week later one had already begun to sprout, which i was excited for but it confused me why there was only one sincei had planted 50. so i sifted through the soil to look at the other bulbs and found that they now had a klittle bit of green mold on the tunic, or outer layer. but the bulbs were still very firm. i then thought that maybe they had not gotten enough water the first time i had watered them so i watered them again. after doing this and doing some research online i now wonder, is the extra water going to make the mold worse? they were planted in pots so that i can transplant them outside when it begins to get warmer…should i take them out of that soil and put them in new dryer soil or just let it be? i also found that some were putting the bulbs in some bleach, can you dig them up and do that and then replant them again? i am so confused…please help me. I’m not sure you will have good results with last year’s bulbs. It depends on how they were stored. Tulips need a cold dormant period to develop a root system. That is why they are planted in the fall. If the bulbs don’t have any roots you could take them out and treat them with a fungicide or try the bleach dip (I have not tried that). Blue mold on the bulbs is not as bad as some other molds. Considering all factors, I would leave things as they are and hope for the best. You need to keep the soil moist so that you get some root formation. Another idea is; if the soil outdoors is workable, plant the bulbs directly into the ground. i have got 3 chinese lanterns which way do i plant them they are shaped like a horse shoe is it the moon shape in the muck or the tails. To plant Chinese lantern (Physalis alkekengi)look for “eyes” or buds on the surface and plant it up-this is where the leaf growth will start. If you can’t find any eyes, plant the fleshy rhizome flat on the soil surface 1-2″ deep. They like sun or very light shade. Be aware that they spread by underground rhizomes and can become invasive. The berry inside the orange papery calyx is poisonous. Chinese lanterns can also be easily grown from seeds. They make a great dried flower arrangements. I’m from Chandler Texas. I’m not sure what zone I’m in now but we do get to where sometime between 60 to 75 degrees. I’m thinking about planting lilies and some butterfly bushes in my front yard lanscape but in the shade area and little of light filter and it now April 16, is it to late to plant it? It’s not too late to plant them. Remember lilies need their heads in the sun and roots in the shade (part shade). i bought a blue hyacinth plant at the store.when is the best time to transplant it into my garden?do i have to wait until the fall?or can i plant it while its blooming and pretty? If you plant your hyacinth while its in bloom, it most likely will not stay in bloom very long. It’s best not to disturb the roots. Enjoy your hyacinth while in bloom and once its finished plant is outside to finish its growing cycle. Just like tulips,its important to let the leave turn tan/brown and die back. We planted bulbs this fall around a new home. When the cold weather set in we used leaves and pine straw to mulch because the compost we started had not had time to mature. The big snow has melted and we have had three warm days. Of course I had to take a look and there are all ready shoots coming up. I am worried about how moist the mulch is after all the snow and wondering if I should remove it and try to find something dryer to remulch with. There can be no way we will not have a few more freezes and the new shoots being up I am afraid I will loose them and lose the ones that are still dormant and seem to be too moist right now. Your bulbs have spent 3 months in the ground and are getting ready for spring. Everything seems wet and soggy right after a winter melt. I would leave the mulch on, maintain even temperatures and protect the new shoots from a hard freeze until warmer weather sets in. You can replace the mulch with dryer material if you feel it is too wet. I want to plant tulips in containers. Should the pots be left outside (Zone 7) or placed in an unheated garage? You can force spring bulbs either way. Bury the tulip pots outdoors. Cover them with sand and mulch to keep them from freezing or keep your pots in an unheated garage or cool cellar. They must have steady temperatures between 35-50F (40F is best) and a dark environment for 12-16 weeks. SHOULD I TRIM MY IRIS’S AFTER BLOOMING? & WHEN SHOULD I PULL UP SOME BULBS TO REPLANT IN A DIFFERENT AREA FOR NEXT YEAR? What can I do with the small bulbs that grow off the mother bulbs of tulips? You can separate and replant the bulbils. They will not produce flowers until they reach maturity which may be 2-3 years. We have inherited extensive bulb plantings from the previous homeowner. One species of yellow daffodil has seemed to mutate over the years, producing very bizarre looking flowers, sort of like a double daffodil with no trumpet. We dug up the bulbs – they looked normal – separated them and replanted them – that didn’t help, even more of them seem to be turning into this bizarre phenotype. Any ideas? Is the soil chemistry wrong? Do they just get old and weird (not unlike us humans….)? There is nothing wrong with your daffodils or soil. 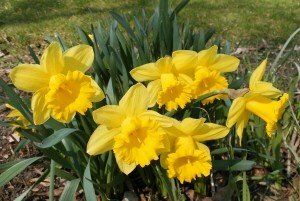 You have a specialt variety of double daffodils-some have extra petals or two trumpets, some look like carnations instead of the trumpet center daffodils. They also have a fragrance. Enjoy their uniqueness. Can I pull up the tulip and buttercup bulbs and save them? If so, how do I need to store them for fall planting? Thanks. You don’t need to dig up your tulips and buttercups. They can remain in the soil. If for some reason you need to dig them up; do so after the leaves have died back (turned yellow) dry them and store in a cool, well ventilated dark place @ 50 degrees. Cut off the flower heads and let the foliage die back so that they can replenish the bulb. You can plant any other annual or perennial to fill in the bare spots until the bulb leaves disappear. I live in zone 5 and planted my bulbs mid November. I noticed early this week they are starting to pop up through the ground! We’ve had mild weather so far this winter. What will happen to my plants? What will happen in the spring when they are to bloom? The warm weather will encourage premature growth and there is little you can do to stop it. Try mulching with evergreen branches or straw and hope for cooler weather. Since the leaves are first to emerge, you may get some yellowing and browning on the foliage but the flower should be alright provided it doesn’t bloom. I’ve just received 100 planting bulbs, it’s still 80-90 degrees in early October when should I plant them? Spring bulbs can be planted before the ground freezes as late as early December(depending on where you live). This gives them enough time to develop a root system before winter. Eventhough its hot you can still plant them in the ground. My husband and I came a across a flower garden while cleaning up brush on our piece of property. Right now all we saw were daffodils that are blooming and looks like Irises coming up and maybe a few tulips?.however?. once we removed the brush from around the daffodils, the next day they started to fall over and turn yellow. What would cause this? Since the other daffodils that have been coming up for a long time in my yard and seem to be blooming just fine. Bought lots of bulbs from a catalog.BIG mistake. They came with lots of fuzzy green mold. I dusted them with fungizide but then the snows came and it was too late to put them in the ground. HELP. Lots of bulbs and the snow has ceased. Should I plant them and see what happens? 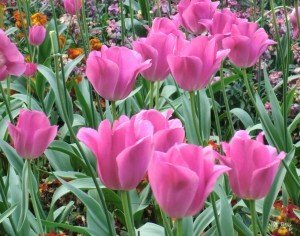 Varieties are tulips, lilies and mostly springlike. Will they come up next spring? Thanks for your help. You should contact your Catalog supplier and complain about the green mold. Demand a refund. If the bulbs a firm, with no soft spots plant them and see what happens next year. The cold weather bulbs require 8-12 wks of a cooling period to develop roots, that’s why they are planted in the fall to give them enough time. My daughter bought a beautiful potted daffodil, hoping to keep it in her room. Within days, all the flowers died and the plant generally looks terrible. She tried finding info on the web, so I told her I would ask you and see what we could do for this poor plant! Potted daffodils will last about 14 days depending on the variety and temperature. They keep longer in a cool room no higher than 65F during the day and 45F-55F at night. You should buy them in their “pencil” stage when buds are still green or just starting to open for maximum longevity. If the plant is finished blooming I would suggest you let the foliage die back (if it is a daffodil) and replant it outdoors for next years blooming. My daughter is getting married the end of May. She wants tulips for her wedding. 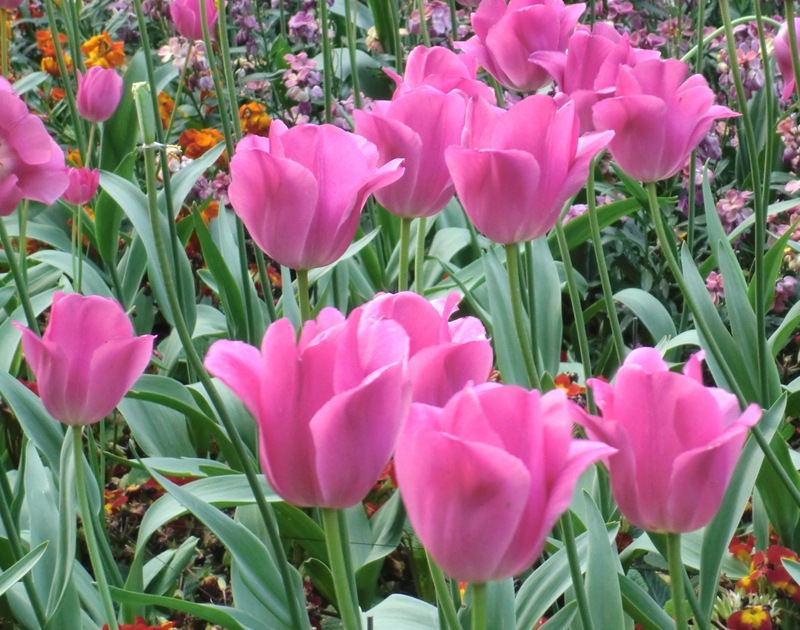 When is the best time to plant the bulbs in order to get tulips to come up around that time? Tulips should be planted in the fall. They need a cold period to develop roots before the winter. It’s too late to plant them outdoors especially if the ground is frozen. You best bet is to buy them. I just bought a lot of bulbs at Home Depot. They say to plant between Sept. and Dec. Even though it is Sept 12, it is still 90degrees in Zone 7. Should I wait until it’s cooler? Thanks. The bulbs need a cooler temperature to develop roots, that’s why there is a 4 month span for planting.You can plant bulbs as long as the ground can be worked. I would wait till its cooler . It’s easier working outdoors in cooler weather. I live in zone 5. 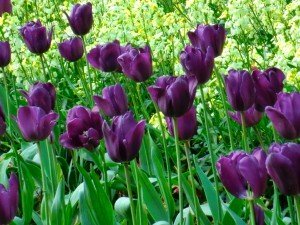 Can I plant bulbs that are to bloom next season now, or in the fall? Fall is the preferred time to plant. You can plant them now if you must. When planting tulips etc. be sure that they are not planted with seasonal plants that like a lot of moisture, too much water can rot the bulbs over the summer. Also if you plant them now, you will disturb any annuals/ perennials that are currently growing. Full sun is all day or six or more hours of sun each day. Partial sun – 3-5 hrs of sun. Part shade – no more than a few hrs of dappled sun. Full shade – no direct sunlight, plants must still receive some filtered light to grow. I would say your situation is part shade. If you are talking about tulips (cold weather) bulbs, you can plant them in the ground but you have to mark where they are and you risk rotting from too much watering or rain. Fall is the better time. I live in a zone 4 and I just purchased some potted bulbs -tulips and dafodils, they are just starting to sprout is it safe to plant them outside yet ? Yes, even with a slight frost they will be fine. A fascinating site. I have a question. Is there such a thing as a Christmas bulb, i.e., a bulb planted at Christmas or earlier that will either sprout or produce a bloom by Christmas.